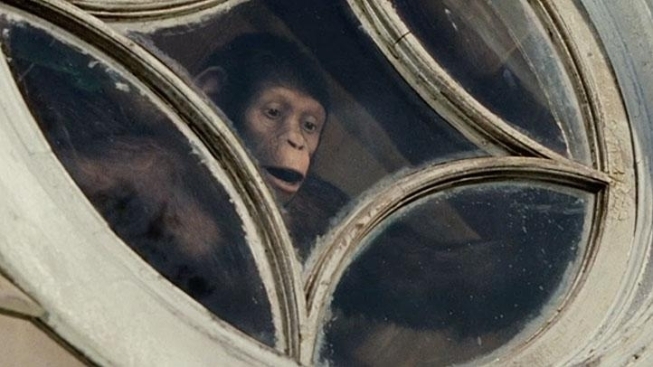 The apes can’t be stopped–on the silver screen, and at the box office. The prequel/franchise reboot “Rise of the Planet of the Apes” killed the competition in its debut weekend with $54 million in earnings, easily topping “The Smurfs,” which brought in $21 million between Friday and Sunday as it dropped to second, according to estimates. “Rise of the Planet of the Apes” stars James Franco, who plays a scientist researching a cure for Alzheimer’s, and Andy Serkis, in another memorable role using motion capture technology, who portrays the revolutionary primate Caesar. The 20th Century Fox release played primarily to an older male audience, EW.com reported. “The Smurfs” tied with “Cowboys & Aliens” last weekend, but the blue cartoon heroes—who come to Manhattan in their big screen reiteration—did substantially better than “Cowboys & Aliens” this time around. The Daniel Craig/Harrison Ford vehicle from Universal Pictures and DreamWorks dropped to third with $15.7 million, bringing its 10-day total to $67.4 million. It cost $163 million to produce, $53 million more than “The Smurfs,” which has brought in $76.2 million to date. The other big release for this weekend, Universal’s “The Change-Up,” a raunchy comedy about Jason Bateman and Ryan Reynolds switching bodies, opened in fourth with $13.5 million. “Harry Potter and the Deathly Hallows – Part 2” was sixth domestically with $12.2 million. It has grossed $342.8 million in the U.S. But it reigned atop the foreign box office for the fourth straight weekend with $61.8 million, courtesy of a splashy debut in China, and has brought in $791.1 million total overseas, The Hollywood Reporter said.